Barolo - the famous little town, located right in the heart of the Langhe wine route is THE destination for those who love Italian food and wine. Just a short way from Barolo is a truly enchanting hotel - The Corte Gondina (view details here). The Corte Gondina is a place where the Italy of your dreams becomes real. It is like starring in Under the Tuscan Sun or some other movie...only better! Give me a choice between the area where that movie was set and here and I'll choose here... ten times out of ten. Well because it is just as lovely, far more genuine and not overrun with tourists. Top of the list must be the Castle of Falletti; views from the walls over the surrounding wine country are magnificent. Most of the castle dates back to the sixteenth century, although its origin are much older. The castle is interesting in its own right but the fact that it often holds very good art and photographical exhibitions and that the original cellars now host the Regional Enoteca make it particularly great to visit. Take the quick thirty minute tour of the castle, which is conducted in English, French or German, and then move onto the Enoteca. What is the Enoteca? Basically a massive wine cellar located in the basement of the castle. The tasting area allows you to try three local wines for €3 or one for 2€. The selection available changes daily in order to allow all local producers a chance to have their wines featured. The idea is that all producers, even the small unknown ones, get an equal chance. Good idea and I am all for promoting small wineries...I even have a wine website that tries to do that but my biggest gripe is that the staff in the shop give you little info about the wines on sale. You are supposed to just wander around and learn about the wines. This is a little unfortunate and if the staff could explain something about the wines on display it would be far more useful. Despite my moans the Enoteca is well worth a visit and the wines are always exceptional. The museum gives you a good understanding of the region and its traditions. I really recommend a wine tour of a couple of the surrounding vineyards too. Here is one such tour that comes highly recommended. If you are in the area in autumn definitely take part in a truffle hunt. The truffles from Piedmont are the most prized in the world. Barolo has another castle... the Castle della Volte. Little remains of what must have been the most strategic of the town's castles, but the view from the castle is stupendous and it is worth visiting. Nearly forgot, there's a lovely pink church, the Chiesa di San Donato, which has its origins in the 15th century. Pop inside and feel a sense of history, of peace and the presence of God. I really mean that; in Italian churches like this I always feel deeply moved... and I'm not even Catholic. Last thing... while in the Langhe area do yourself a favour and have lunch at the Belvedere Restaurant, a really fabulous restaurant. 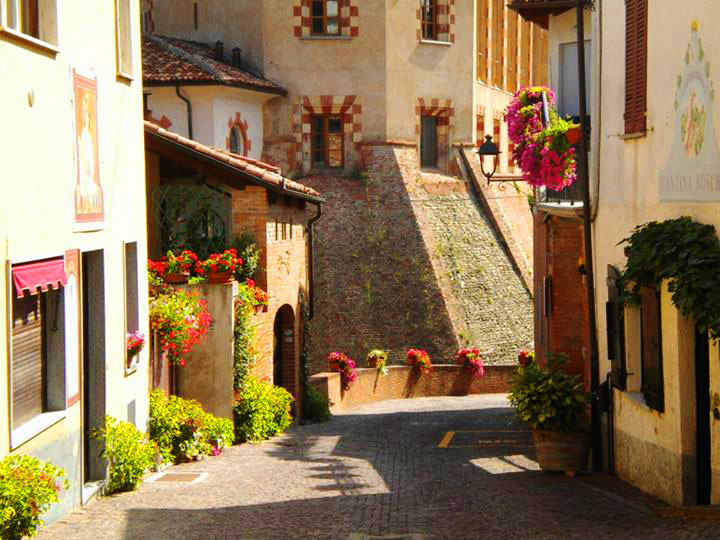 Another gorgeous town in the area, voted one of Italy's loveliest, is Neive. 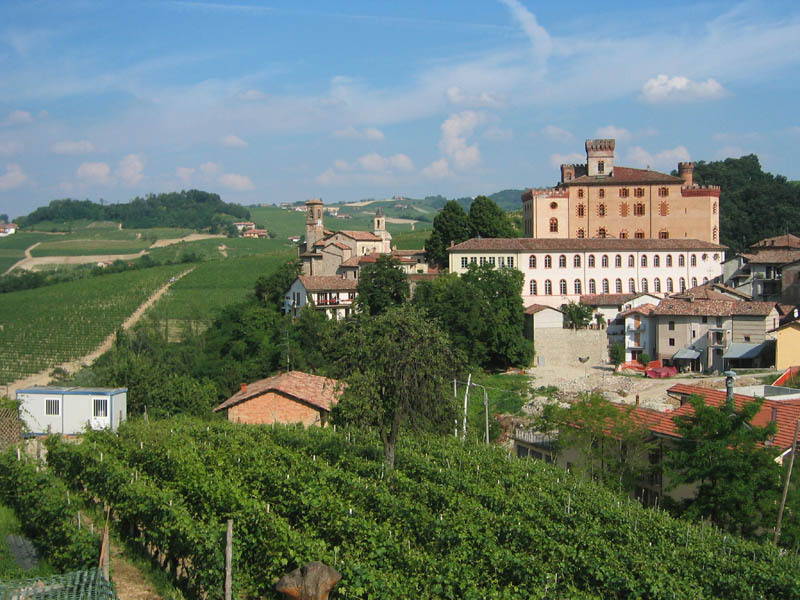 For more tours of this area please visit our Piedmont and Italian Barolo wine region tours page.